Zaanse Schans with the many windmills and cottages, in the Netherlands. After a tiring drive from Volendam, we finally arrived! And finally, a special thanks to EXPEDIA PACKAGES for making such incredible journeys possible! Zaanse Schans is a small village on the banks of the Zaan river, complete with tidy green houses, real working windmills, and small topical museums such as the Clock Museum and the first Albert Heijn store. In the 17th and 18th century there were thousands of windmills along the dykes; sawmills, dye mills & oil mills that powered the Dutch economy. 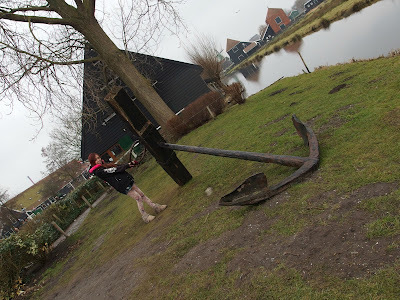 The Zaanse Schans village gives you a picture of what it must have been like. 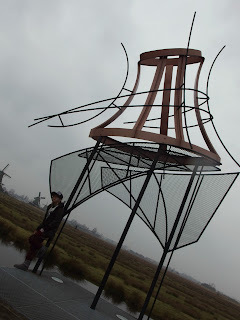 Not all the windmills and buildings started out in Zaanse Schans, many of them were moved here from the region as they came under threat from urban development across North Holland. The windmills are all working mills, and the perform various functions, including a saw mill, a paint mill (grinding pigments), and oil mill (grinding linseed or peanuts to draw off the oil). The oil mill was working so that’s the one we looked through. On the ground floor of the oil mill for example, you can see huge grindstones crushing peanuts which were then roasted and pressed so that the oil could be extracted. Both the grindstones and the press are driven by the windmill. Just like something you’ll only see in movies isn’t it? I would safely say Zaanse Schans is one of the best day trips out of Amsterdam. Yes it’s a little touristy, but the windmills are in working order and are fascinating. There are also several other mini-museums in the village, here’s one of them. See the antique clocks, or buy sweets from the oldest Albert Heijn shop. Wooden Shoes that are surprisingly comfortable! In the Klompenmakerig Wooden Shoe Workshop, you can see clogs being made. Here you can watch clog making demonstrations using an early clog making machine and finished off, by hand. Free clog making demonstrations take place at regular intervals throughout the day. The Klompenmakerig Wooden Shoe Workshop was situated in a former 1780 snuff and grain warehouse from the company Molenaar in Westzaan. They relocated to the Zaanse Schans in 1984. Famous Clogs of the Netherlands of all colors, shapes & sizes! Part of the storehouse has been devoted to the Wooden Shoe Museum, one of the largest and most beautiful collections of wooden shoes in the Netherlands. 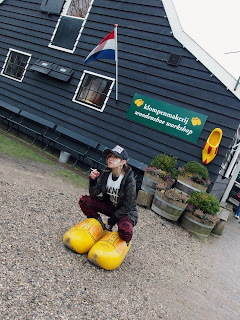 A trip to The Zaanse Schans would not be complete without a visit to the Klompenmakerig Wooden Shoe Workshop/Museum. In this magnificent old warehouse, once used for storing snuff and grain, is one of the finest and most extensive collection of wooden shoes to be found anywhere in the world. Try some on to see what they’re like to walk in! Over a million Dutch people still wear them regularly! I simply love these beautiful Windmills. There’s a farm, out there in the distance! Alright now, I’m sorry for being so lame! Here are the rest of the pictures! Even though they’re bare, these trees still look beautiful! Stay tuned for part 5! Please feel free to follow me via GFC. It’s right at the top of my blog. Google+ & Bloglovin’s good too!! Thankyou & Thanks for reading! lovee it so much ! i wish i could go to netherlands too ! Stay tuned to my page for future updates! hello i nominated you to liebster award !